Keeping my workout clothes clean is obviously very important. I want to be able to wear them on a day to day basis and not just exercising. I usually have a separate load for workout attire and bump up the detergent. It works. However, it may not work for everyone. I wanted to try a method that would freshen up my clothes even further. When I think of natural cleaners, I immediately think of baking soda and vinegar. I went online, did some research and was happy to find that other people have tried these ingredients as well! I found measurements for each, checked my cabinet and did a load of laundry. Baking soda is a natural deodorizer. I added one cup with my detergent. My clothes smelled super fresh. I also had a box of it in my cabinet. Win! The only vinegar I had in my cabinet was apple cider vinegar…and that just wasn’t going to do the trick. So, I will have to try this method another time. 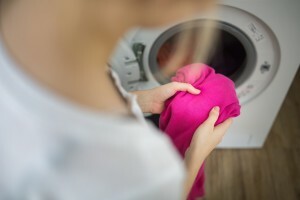 But, when using white vinegar for clothing, you are supposed to let the clothing soak prior to washing with detergent. Add a cup of vinegar to a “delicate” soak cycle. I try to use natural cleaners as often as possible. There are detergents out there for super stinky gym clothes, but I don’t feel the need to buy it when baking soda works! Tell me…what other natural cleaners or methods have you tried?